1,166 pages | 454 B/W Illus. 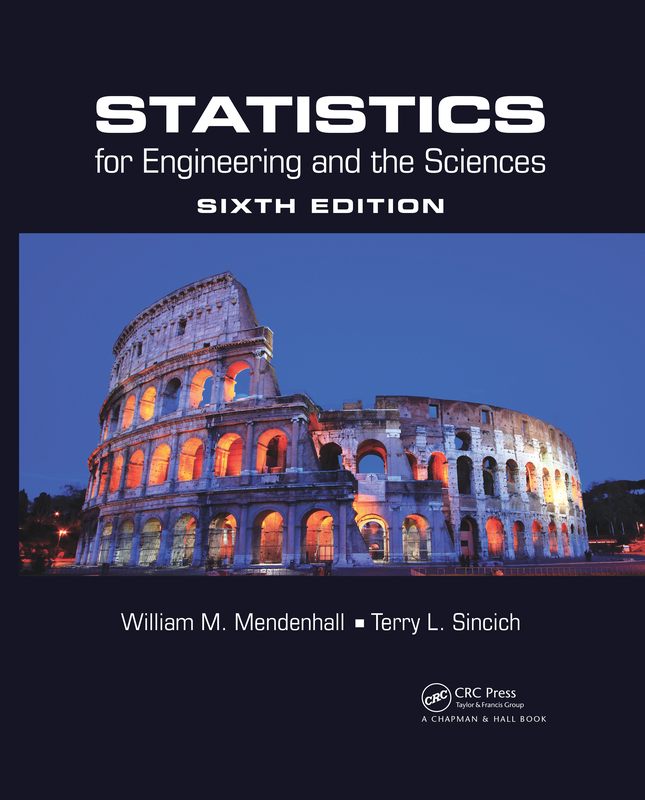 Statistics for Engineering and the Sciences, Sixth Edition is designed for a two-semester introductory course on statistics for students majoring in engineering or any of the physical sciences. This popular text continues to teach students the basic concepts of data description and statistical inference as well as the statistical methods necessary for real-world applications. Students will understand how to collect and analyze data and think critically about the results. The first several chapters of the book identify the objectives of statistics, explain how to describe data, and present the basic concepts of probability. The text then introduces the two methods for making inferences about population parameters: estimation with confidence intervals and hypothesis testing. The remaining chapters extend these concepts to cover other topics useful in analyzing engineering and scientific data, including the analysis of categorical data, regression analysis, model building, analysis of variance for designed experiments, nonparametric statistics, statistical quality control, and product and system reliability. "A salient feature of this book is the clarity with which many statistical concepts have been presented. A very nice blend of theory and applications. It contains a wealth of illustrative examples and problem sets. All the important concepts have been highlighted; real-life data has been extensively used throughout the book. Students will find it very appealing and useful on their way to learning the basic statistical concepts and tools." "I like the problems because they are all based on engineering applications of probability and statistics. I especially like the problems at the end of chapters because students have to think more to solve them. I favor problems that require calculations because engineers are problem solvers." "I think this text is one of the best I have seen when it comes down to real data sets. The authors successfully included small and large real data sets from various real-world problems in engineering, mathematical sciences, and natural sciences." STATISTICS IN ACTION The Case of the Ghoulish Transplant Tissue—Who Is Responsible for Paying Damages? STATISTICS IN ACTION Can Dowsers Really Detect Water? STATISTICS IN ACTION REVISITED Can Dowsers Really Detect Water? STATISTICS IN ACTION How Vulnerable Are New Hampshire Wells to Groundwater Contamination? STATISTICS IN ACTION REVISITED How Vulnerable Are New Hampshire Wells to Groundwater Contamination? William Mendenhall was a professor emeritus in the Statistics Department and the first chairman of the department at the University of Florida. Dr. Mendenhall published articles in top statistics journals and was a prolific author of statistics textbooks. Terry L. Sincich is an associate professor in the Information Systems Decision Sciences Department at the University of South Florida, where he teaches introductory statistics at the undergraduate level and advanced statistics courses at the doctoral level. He has won numerous teaching awards, including the Kahn Teaching Award and Outstanding Teacher Award. Dr. Sincich is a member of the American Statistical Association and the Decision Sciences Institute. His research interests include applied statistical analysis and statistical modeling.